When in India, speak as Indians do - in over 15 languages! Though many of us speak English well, we are truly at home only with our mother tongue. We consider it "our own". And we prefer this language over English for private communication - whether spoken, email, or Whatsapp. 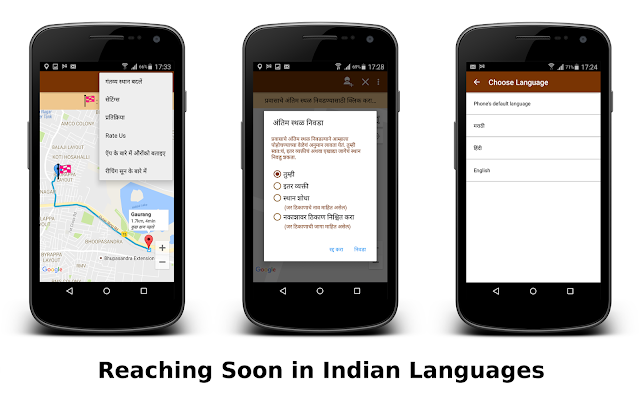 After we launched Reaching Soon in Marathi and Hindi, we were overwhelmed by feedback we received - in these languages! Being able to use Reaching Soon in their own language, seemed to touch a chord with our users. No wonder then, that our users are loving Reaching Soon! 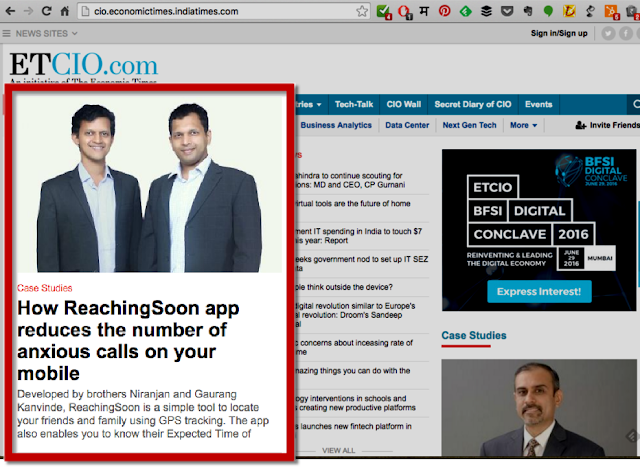 With this insight, we are now working on getting the app translated to about 10 Indian languages. I want to share how we did it, so that more developers can bring out their lovely apps in "our" languages! Typically in an app, the English messages are very terse. When translating to another language, one must keep it crisp, without losing the beauty of the language. To ensure this, get your translations vetted by a native speaker of the language. It is better to use colloquial rather than chaste language. If the English words themselves are widely used and understood, use them instead of translating. E.g. App, Metro, Bus, etc - it is better to use these English words, perhaps in the script of that language. Some languages are more verbose than English, or may require a larger font to be rendered properly. This could throw your app's UI out of alignment. Make sure you translate appropriately, and design the UI to address this. Different languages have different gramar rules for handling subject and predicate. When constructing Strings in your app, it's very convenient to simply add the component strings. However, resist that urge, and use String.format instead. This enables you to easily address the language grammar in the appropriate strings.xml file. Very convenient to use. Shows all your strings together, and lets you change any of them. You can keep track of all translations at the same place. However, writing in Indian languages is very difficult. Google spreadsheets together with Google Input Tools, is the most practical way of writing in languages with various scripts. It also becomes convenient to collaborate with native speakers for translations. You can easily copy the original strings from the Translations editor to a spreadsheet. The linux script can be easily adapted for DOS and MAC. If anyone wants to contribute such an adaptation, please let me know, and I will happily add it here.